Often packed to the brim, Shin Minori’s constant stream of customers is further testimony of their value-for-money Japanese Buffet. 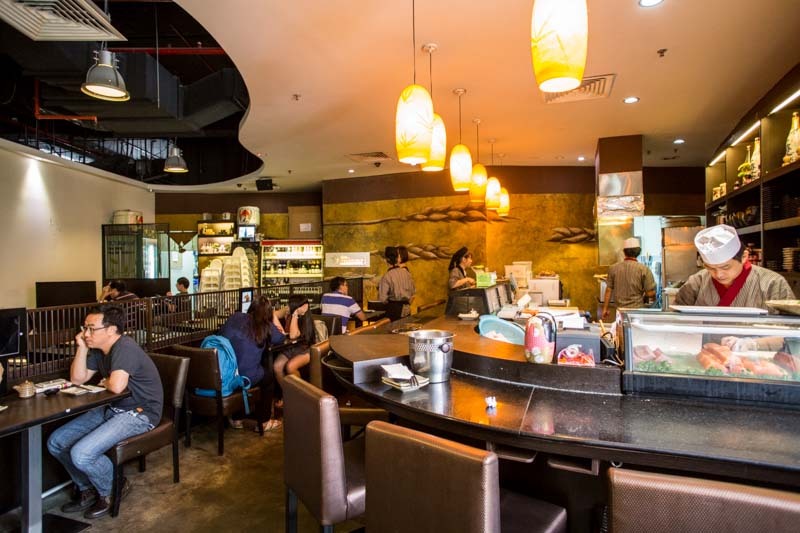 Tucked away in a corner up in UE Square, this restaurant proves to be quite the hidden gem. 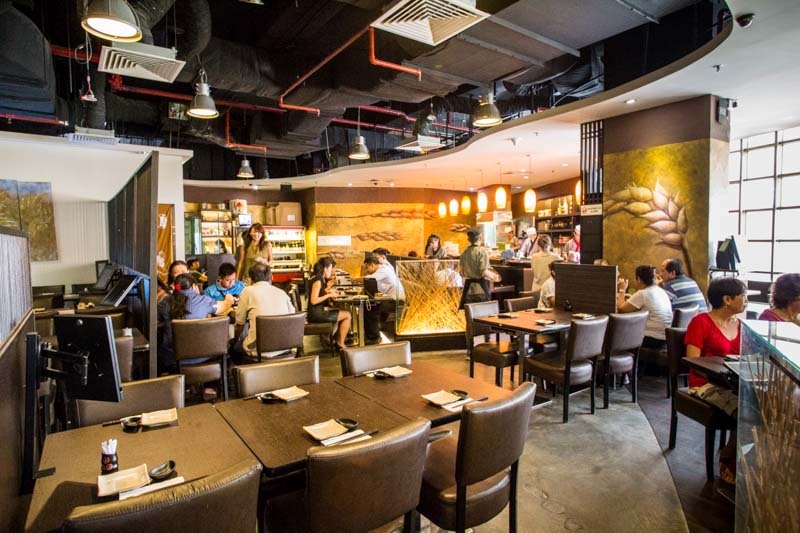 Decked out in golden hues and a open sushi bar, its a casual yet comforting affair at Shin Minori. For just $34++ during lunch, patrons can enjoy a huge range of fresh, premium sashimi, tasty makis and their grilled teriyaki selection among many others. Precisely why Shin Minori seems to be a great location for family buffets or corporate gatherings, with something for everyone. With a selection of premium, fresh cuts, Shin Minori is not one to skim on the thickness of the cut. 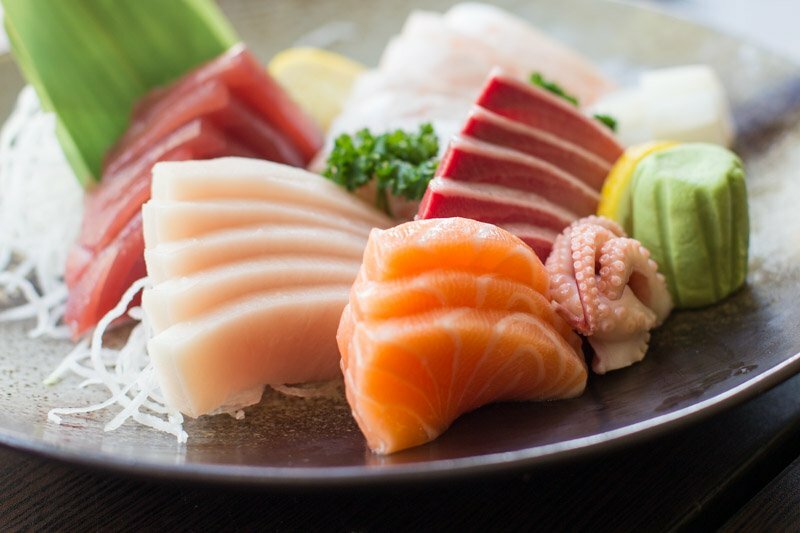 Each slice of sashimi is of sufficient thickness, and we could tell that it was really fresh. Above you can see the salmon, tuna, swordfish, yellowtail, octopus, salmon belly and squid. Shin Minori offers 3 slices per order (or you could choose the assorted platter), but what we really appreciated is the ease of ordering through the electronic tablet menu. Meaning, you can order as many servings as you like in one setting with no confusion and hassle. Talk about an overload of sashimi! We were also pretty much a fan of their maki sushi rolls. 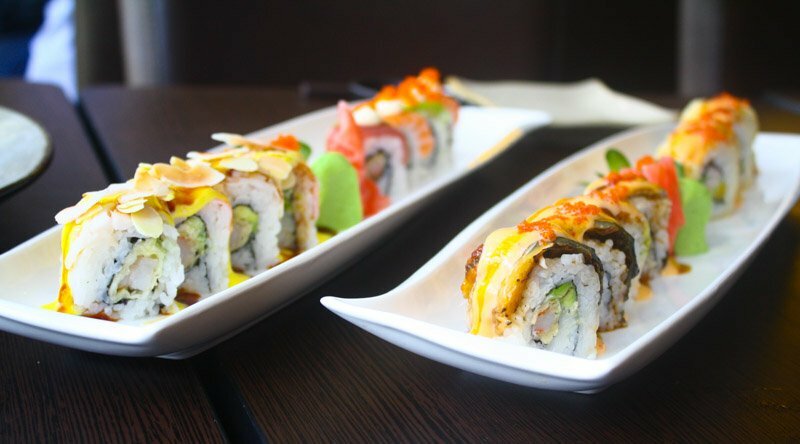 Above is a few mixed selections of their specialty makis, namely half the Harvest Maki Roll and Rainbow Maki Roll on the left. I particularly liked their Harvest Maki Roll, with coconut and almond flakes sprinkled on top, made for an interesting combination of taste and textures; sweet yet savoury, soft yet crunchy. 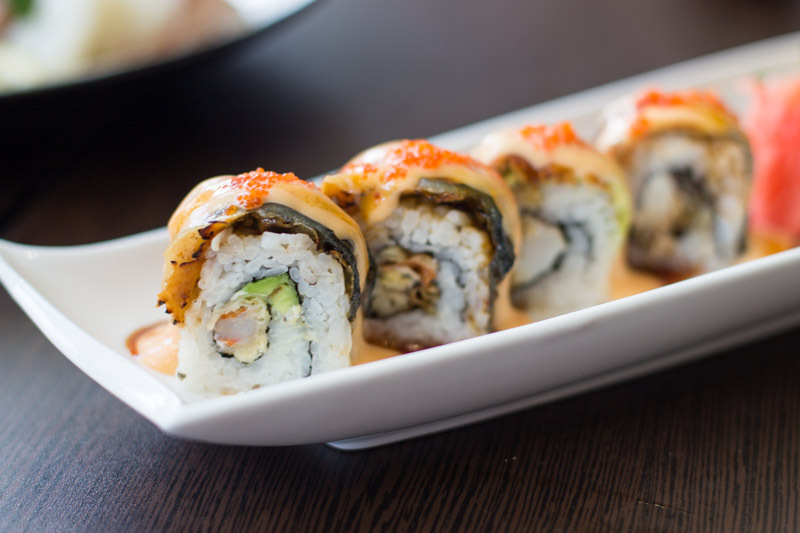 Their Dragonfly Maki Roll was pretty good as well, with the crunch of soft shell crab within wrapped with softer textures of eel and avocado. Baked Scallops. This actually, was a favourite of mine. I ate almost the whole plate. 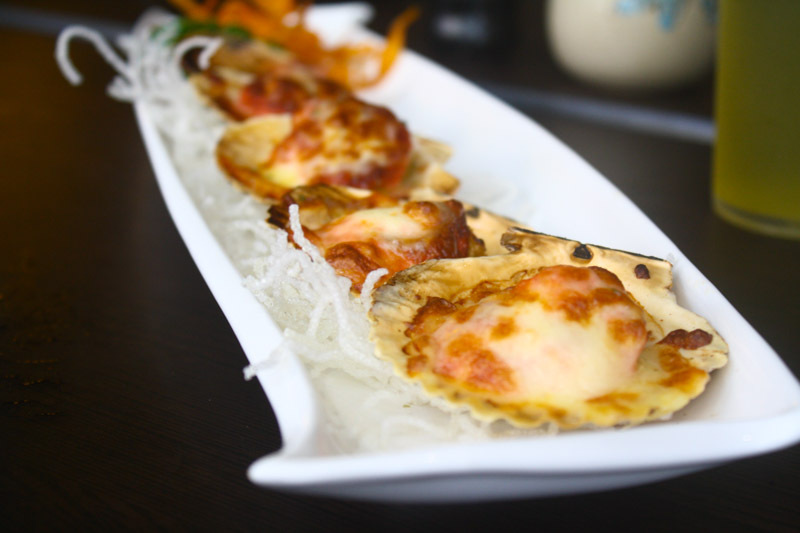 It was a simple dish of scallops baked with creamy mentaiko roe and cheese, but the combination of a salty, cream-based sauce with melted cheese atop a firmer scallop was just heavenly. I think I am now a definite fan of mentaiko roe. We also tried their Tempura. 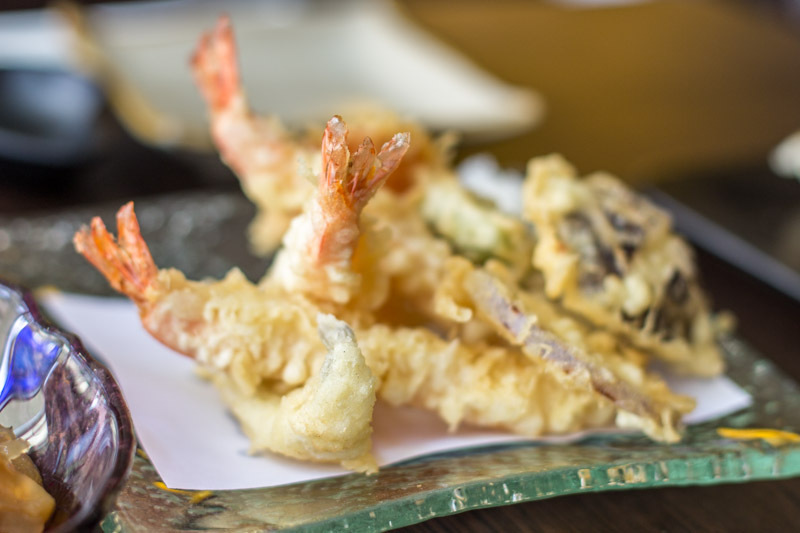 It was nothing much special, just like your usual fried tempura with ebi and side vegetables. But their prawns used were very much fresh, although the batter was a tad too thickened for my liking. Meh. 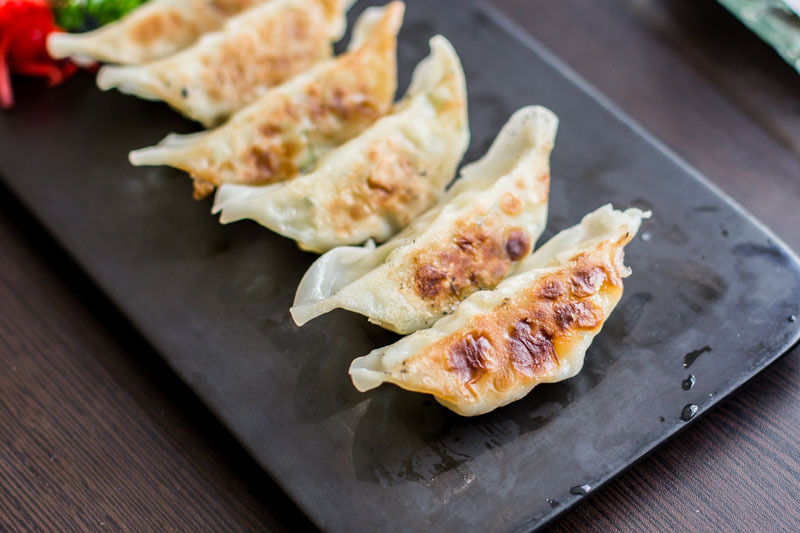 Gyoza Dumplings. I wasn’t too big a fan of Gyoza to begin with and sad to say, Shin Minori’s rendition of the classic Japanese Gyoza did not convert me into even half a Gyoza gobbler. I also felt it could be pan-fried just a tad longer to retain a certain crispiness to the skin. Grilled Salmon. Now, I am a fan of Salmon, and I can say that their version is well, slightly above average. If you like your salmon, then yes, go for this dish. 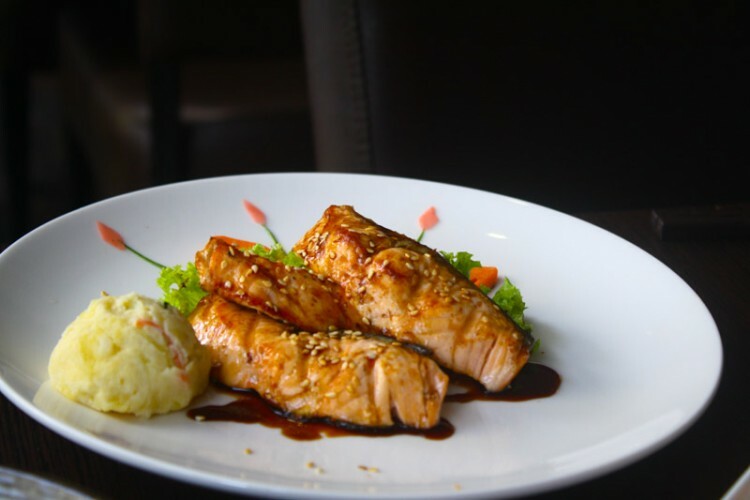 Their salmon was firm yet tender, and drizzled with their own teriyaki sauce, it brought out flavour and negated the fishiness that some carry with them. The Grilled Chicken Skin, Pork Belly, Gingko Nuts, Shishamo and Bacon wrapped Asparagus. They were all pretty good, and were grilled to perfection, in my opinion. It wasn’t too charred, but grilled enough to retain a slightly charred taste and the flavourful juices, with a slightly crisp exterior. I wasn’t a fan of the gingko nuts though. Even though lightly salted, it couldn’t take away the bitter aftertaste left behind by the seed of the nut that was grilled together. 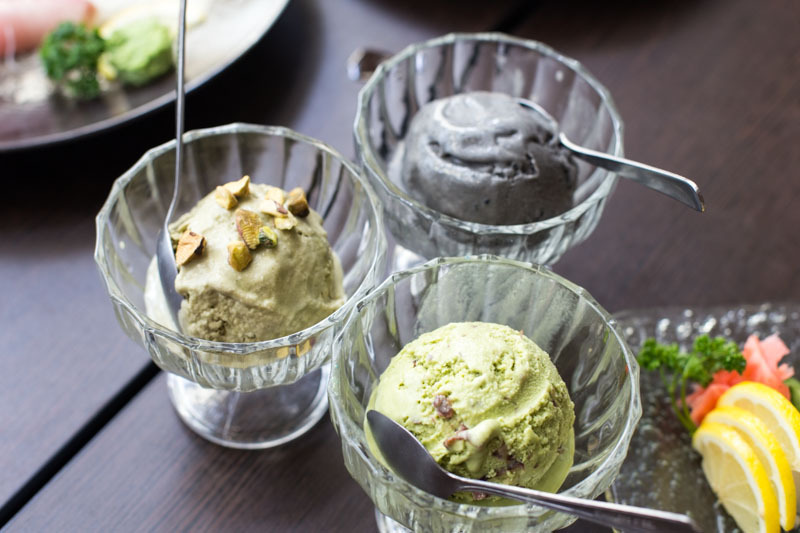 Lastly for desserts, we had their Black Sesame, Matcha with Azuki Beans and Pistachio Ice Cream. These were not included in the buffet, so if you’re craving for ice cream, you would need to top up an additional $8.50 for a double scoop. I would advice against it though, their ice creams had quite a bit of ice crystals and were pretty ordinary. For that price, I’m sure you can get much better ones even around in Clarke Quay. 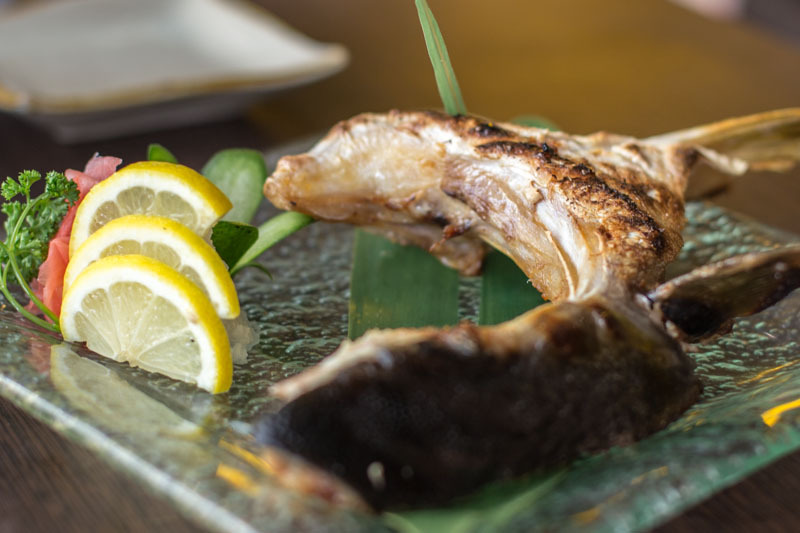 Yellowtail Collar. Off the menu and especially served to special guests and loyal customers. Overall, Shin Minori proves to be an extremely value-for-money buffet restaurant. 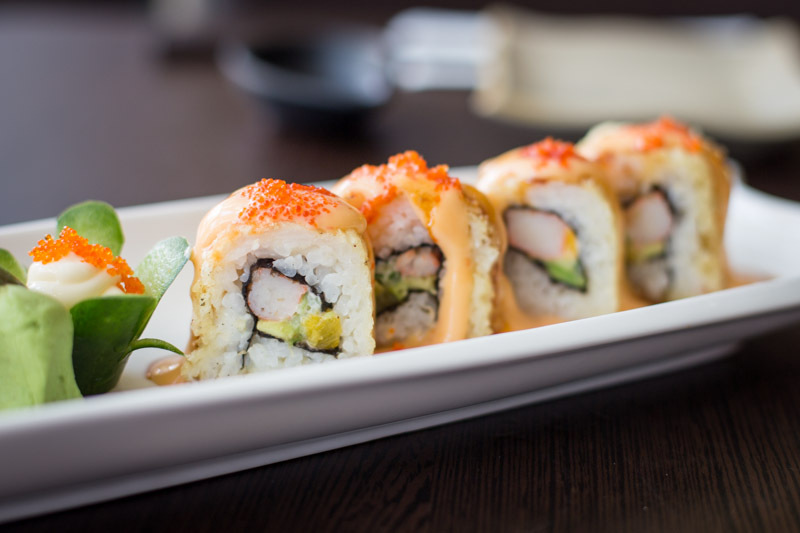 Premium cuts of sashimi, together with a wide variety of delectable grilled dishes, sushis, fried dishes, maki and pizza even! Most of the dishes are above average. 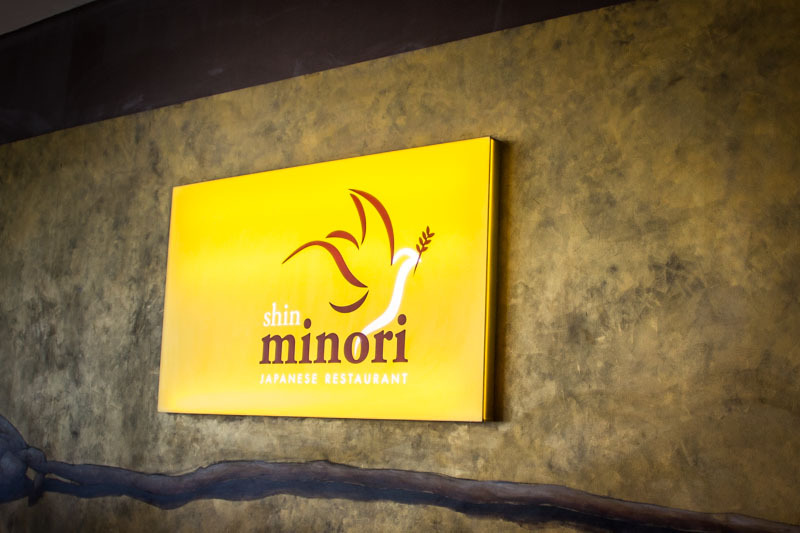 I’m sure anyone would be able to find what they love here at Shin Minori. 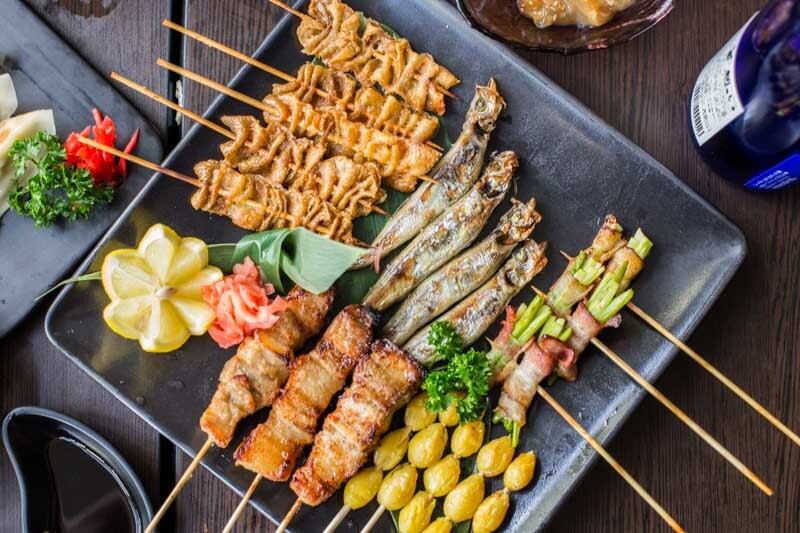 I would definitely recommend it if you would want to find a Japanese buffet restaurant that serves quality cuisine, but still at an affordable price. Cheers to Shin Minori. Expected Damage: $34++ for adults during lunch, $24++ for child. Dinner starts at $37++ for adults and $25++ for children.